The ALADIN project is a very important international cooperation for the Hungarian Meteorological Service (OMSZ) in the field of numerical weather prediction (NWP). 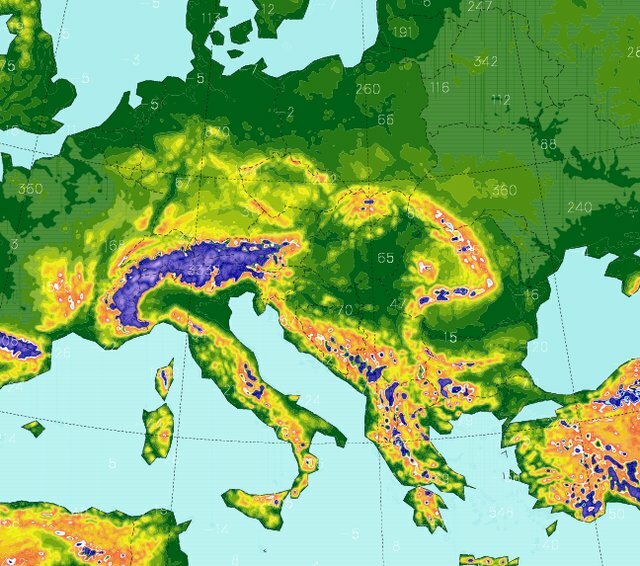 The project was initiated by Meteo-France by the end of 1990 where today 16 national meteorological institutes are involved. OMSZ is an active participant of this cooperation from the beginning, which aims at developing a state of the art regional NWP model system. Today, as a result of the ALADIN project, two regional NWP models (ALADIN and AROME) are run operationally at OMSZ serving forecasters and other end users. From 2004 onwards, the HIRLAM consortium (another European NWP cooperation with 10 member countries) joined the development of the ALADIN and AROME models. Further information on the above-mentioned cooperation can be found on the ALADIN and HIRLAM websites. Dynamical core: both models use a spectral representation, that is they provide a bi-Fourier transformation of meteorological variables enabling an easy (analytical) spatial differentiation. The time discretization is performed by the application of a semi-implicit, semi-Lagrange scheme in both models. Such combination of time discretization schemes enables stability even in case of relatively long time steps, which makes the forecast efficient in terms of computational costs. The dynamical core of the ALADIN and AROME models enables both hydrostatic (neglecting vertical accelerations) and non-hydrostatic integrations (allowing vertical accelerations). In the ALADIN model the hydrostatic approximation is used because in weather systems larger than its resolution (8 km) the accelerations in vertical are negligible compared those in horizontal. The AROME model is run with the non-hydrostatic dynamics given the fact that at the scales of the AROME resolution (2.5 km) vertical accelerations are as important as those in horizontal directions. Physical parametrizations: processes with a characteristic size below the grid resolution or highly complex processes (radiation, turbulence, convection, cloud-physics, orographycal effects) are taken into account through parametrizations. These physical parametrizations are significantly different in the ALADIN and AROME models. It is important from a historical point of view that the development of physical parametrization packages used in the ALADIN model (ALADIN and ALARO physical parametrization packages) was based on the regional adaptation of the parametrization package used in the ARPEGE French global model. On the other hand the AROME physical parametrizations were adapted from a high-resolution meso-scale non-hydrostatic French research model (Meso-NH). The most important conceptual difference between the two physics packages is that the ALADIN model describes convection (both deep and shallow) through parametrization schemes, while the AROME model resolves deep convection explicitly (still parametrizing shallow convection). Data assimilation and initialization (determining initial conditions): initial conditions for model forecasts are provided by a statistically optimal blend of meteorological observations and earlier model forecasts (optimal interpolation, variational assimilation). The deterministic version of the ALADIN model is initialized by a local data assimilation system, while the AROME model uses interpolated ALADIN initial conditions. A local data assimilation system for the AROME model is under development, which will take into account observations in higher resolution compared to ALADIN in order to enable meso-scale meteorological systems to appear in the initial conditions. Gravity waves being unimportant in the ALADIN forecasts are filtered by digital filtering. In case of the AROME model even the high-frequency gravity waves are not filtered because this model – due to its high resolution and non-hydrostatic dynamical core – is able to evolve them realistically. Coupling: as the ALADIN and AROME models are both regional, it is indispensable to provide them with information about processes outside their geographical domain in the form of lateral boundary conditions (LBC). For the deterministic ALADIN model these LBCs are taken from the global forecasts of the ECMWF, while in the AROME model they are obtained from the ALADIN forecasts. The ALADIN based ensemble system uses the ICs and LBCs of the PEARP which is a French global ensemble system. PEARP has basically 35 members and the first 11 from these members are used in the regional system of the Hungarian Meteorological Service. The ALADIN and AROME models are run on the supercomputer of OMSZ (IBM iDataplex Linux cluster), which involves about 1000 cores (Intel Xeon 2,6 Ghz) and 3.3 Tbyte internal memory. It is important to mention that within the ALADIN consortium, a smaller and more tight cooperation emerged called RC LACE (Regional Cooperation for Limited Area Modeling in Central Europe), where OMSZ is an active participating member too as well. The main goal of this cooperation is that members institutions (Austria, Croatia, Czech Republic, Hungary, Romania, Slovakia, Slovenia) commit for a common research strategy for the development of their models and share resources for the highest possible efficiency in research and development work. OMSZ is one of the most important members of LACE in the field of data assimilation providing an operational service of observation preprocessing for data assimilation purposes for the whole community (OPLACE). Further development of the local data assimilation system for the ALADIN model: using satellite and GPS observations in an increased resolution, improved representation of background error covariances, introduction of flow dependence to background error statistics. Development of a data assimilation system for the AROME model (3d-var for the atmospheric levels and optimal interpolation or simplified Kalman Filter for the surface/soil variables). Assimilation of radar (reflectivity and radial wind) data in the atmospheric 3d-var in order to initialize convective systems. Development of the physical parametrizations of the AROME model with a special emphasis on turbulence. Increase the resolution of the AROME model to ~1 km in experimental runs and study the implied changes in the performance of turbulence parametrizations. Development of the probabilistic forecast system based on the ALADIN model (and on the long term based on the AROME model) through the implementation of local initial and model perturbations (using the ensemble data assimilation technique and the multi-physics approach). Horányi A., Ihász I. and Radnóti G., 1996: ARPEGE/ALADIN: a numerical weather prediction model for Central-Europe with the participation of the Hungarian Meteorological Service. Időjárás, 100, 277-301. Horányi A., Kertész S., Kullmann L. and Radnóti G., 2006: The ARPEGE/ALADIN mesoscale numerical modeling system and its application at the Hungarian Meteorological Service. Időjárás, 110, 203–227.